Moving is a job that must be done safely to be done right. To ensure safe conditions, our moving company in Gainesville takes several precautions. These include not stacking boxes so high they tip over and not allowing pets to ride in the backs of moving trucks, where objects could fall on them. In addition to these safety basics, our professional movers also recommend that homeowners take measures to keep both their homes safe. Although this sounds like a tall order, the reality is that just a few precautions will protect both residences during a move. Because of the friendly culture of Gainesville moving in the city is generally safe. That being said, movers still recommend people take extra precautions (such as keeping doors closed) to avoid security breaches, no matter how improbable they may seem. Propping open the front door of your home, for example, makes loading or unloading the moving truck go faster. However, depending on the distance that the truck is parked from the house, your open door could be unmonitored long enough for somebody to enter and commit theft, especially if you live around lots of people, like at an apartment complex. When carrying boxes to the moving truck, it’s wiser to close the door each time you leave or have a trusted person watching the door. Most of the time, movers aim to transport the contents of a home in one load. During a DIY move, though, it’s common to carry several carloads of items over multiple days. But this could also result in your home sitting unprotected with a portion of the belongings inside. Aside from locking the doors, another safety precaution is thus to deter attention from the fact that your home is unoccupied. One conspicuous sign that a house is empty, for example, is when the window shades or drapes are missing. This gives would-be thieves a clear view of the interior and all your vulnerable possessions. By leaving up the window hangings, you make an unoccupied house appear lived-in. Of course, there’s also the possibility that a passerby, undeterred by the presence of drapes, peers through the window and observes that nobody is home. To further guard against intrusions, take away all enticements to burglars by moving your valuables out-of-sight of the window. You also could keep any high-ticket items in a storage unit until the last day of the move. The best way to protect your old and new homes while moving is by hiring movers in Gainesville who have favorable reputations for both trustworthiness and efficiency. The greater the length of time it takes to complete a move, the more chances exist for safety breaches and other mishaps. But professional movers will finish the job quickly and with minimal hassle. Experienced movers also can give you more safety tips. 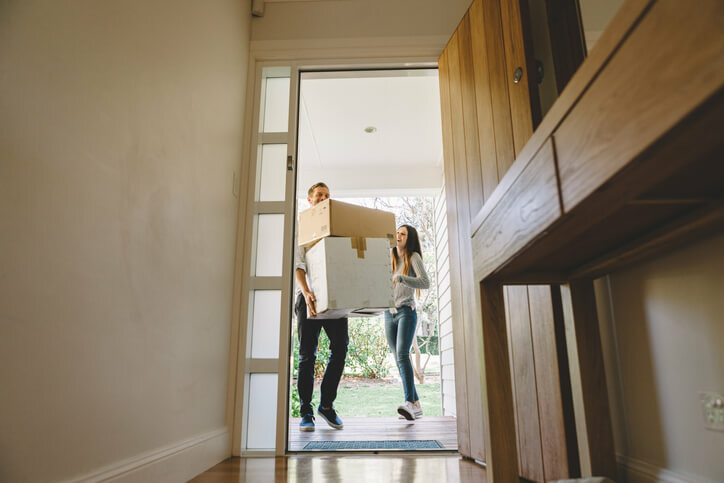 One piece of advice for college students and families with teens, for example, is to avoid posting news or images of the move on social media while the move is happening. You never know when a seemingly innocuous photo of your half-empty house might inspire some unknown person to drop by and case the place. But after the move, go ahead and post any details you want to share. From local moves to long-distance relocations, UF Mover Guys handles all types of residential moves in Gainesville. Whether you’re leaving a family home or a student dorm, we have a fleet of moving trucks that can match up with any size of moving job. Hire us to take care of one part of the move, such as the packing or loading and unloading, or sit back and let us manage the entire job. For a free moving quote, give us a call today.